The idea is to profit from changes in assets pricing. You need to decide whether the price will go up or down during a determined period of time. You choose the asset, investment amount, and the expiration time. Your trade can be as long as a month or a quick trade for the end of the hour. To begin trading, you must create an account with a binary options broker so you can access a binary options trading platform. 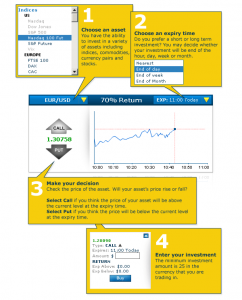 The minimum deposit required to trade varies depending on the currency you will be trading in and the rules of the specific binary options broker that you select, so it is normally a good idea to have a binary options broker recommended to you by someone familiar with how they operate and their trading policies. Once you have decided on an asset to trade along with the direction and expiry, you only need to follow a few simple steps to enter a trade in the amount you select based on the currency of your account. Below you will see “step by step” instructions of exactly how to enter a trade. Once your selections have been made and the trade is accepted by the broker, all you have to do is sit back and wait for your trade to expire “in the money”, meaning you will profit the designated percentage you selected when you first entered the trade or “out of the money” meaning you will lose the amount traded less the refund (if any) given by the broker on the trade. Note: Check your broker information for refund amount for losing trades. Some give up to 15%. In any case, you know BEFORE you place the trade what your profit or loss will be when the trade expires. Note: Payouts vs Refunds vary depending on different brokers and assets.